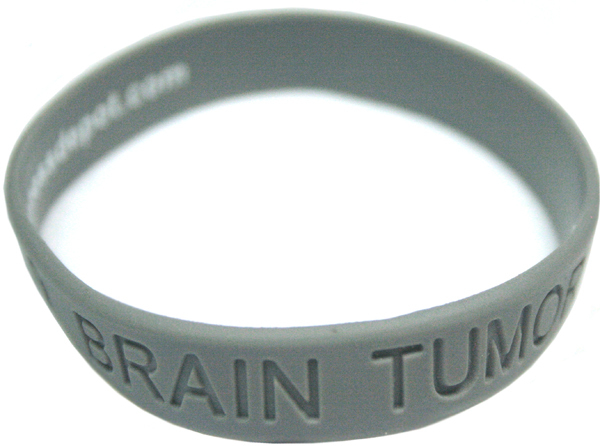 Brain Tumor Awareness Bracelet is made of 100% silicone. Brain Tumor Awareness Bracelet is debossed (engraved) just like the LIVESTRONG bracelet. This Brain Tumor Awareness Bracelet is gray. It also has the Brain Tumor Awareness ribbon on each side of the bracelet. Wearing this Brain Tumor Awareness Bracelet is an excellent way to show your support for victims of brain tumors.